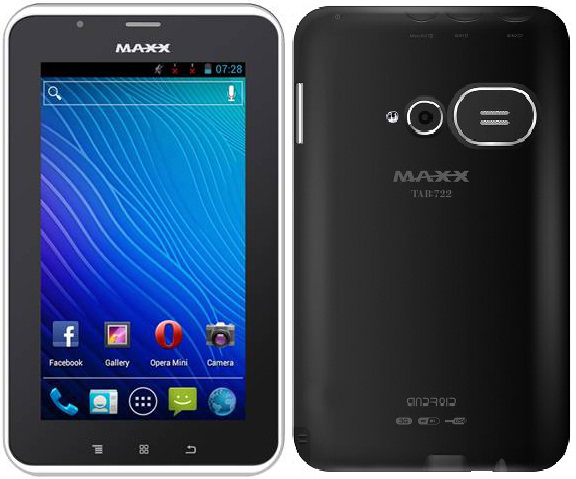 Maxx has recently unveiled a new Tab Maxx TAB722 in the Indian market,which is priced at Rs. 8,000/- (Approx). Maxx TAB722 sports with a 7 Inches capacitive touch screen with a screen resolution of 480 x 800 Pixels.The tab is chipped with a 1 GHz Cortex A9 processor with 512MB of RAM. It runs on Android v4.0.4 (Ice Cream Sandwich) OS. The tab comes with 3 megapixels rear camera and 1.3MP front camera with VGA support. Maxx TAB722 comes with 4GB of internal storage which is expanded up to 32GB via microSD card. The connectivity features of Maxx TAB722 are Wi-Fi, Bluetooth, GPRS, Micro-USB, 3.5mm audio jack and it supports mini SIM connectivity.The capacity of battery is loaded with 3000 mAh.